From Rydal Road car park near the museum we make our way over the little bridge turn left then right onto the Kirkstone Pass road. We take the first left then keep heading forwards along Nook Lane following the sign for Low Sweden Bridge past the University of Cumbria and the Wynford Guest House. We pass through Nook End Farm and follow the track over Low Sweden Bridge. We keep following the path uphill and when the path splits we keep to the lower right path. The path soon splits again and we again take the right path. We pass a sheep fold and ignore the path to the right downhill to High Sweden Bridge. We keep following the path steeply uphill to the crags of Low Pike and High Pike in the distance slightly to our left. 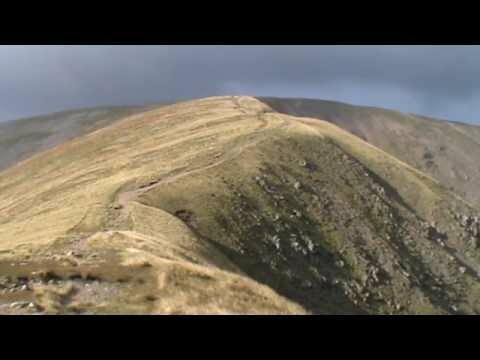 We follow the wall on our left to the summit of Dove Crag. We keep following the path and after a little scrambling we make our way over Heart Crag. From here we keep heading uphill on the wide well defined path to the flat summit of Fairfield. At the half circle stone wind shelter we turn left and follow the cairns heading towards the two humps of Great Rigg and Heron Pike we can see on the skyline. We drop off downhill then make our way up and over Great Rigg. We keep following the path as it drops down then up again to the summit of Heron Pike. We then start to make our way steeply downhill following the zigzag path to the bottom. At the bottom we go through the gate and turn right past Rydal Mount (Wordsworth’s home) then take the path on the left through the grounds of Rydal Hall following the footpath signs. At the end of the buildings we go through a gate and follow the track to the main road. We turn left and follow Rydal Road, A591, back to the car park. This is a hard walk on good well walked paths and tracks with steep inclines and declines with a little scrambling. Approx 10.7 miles allow 5 to 6 hours using OS Explorer Map OL7, The English Lakes, South-eastern area and OL5, The English Lakes, North-eastern area. There are four public toilets, Cheapside behind Barclay’s Bank, Low Fold car park on Lake Road, entrance to Rothay Park on Vicarage Road and Rydal Road car park. For refreshments there is a good variety of shops, cafes, pubs and restaurants to choose from.